He’s big, he’s mighty and he’s the best Thor lookalike that we’ve seen, meet Andrew Lutomski. Bulk Ambassador Andrew is a Melbourne based actor and model. He is best known for his work as a character actor particularly his depiction of Marvel character Thor. In fact, he looks so similar to the real-life Thor actor, Chris Hemsworth, it's uncanny! 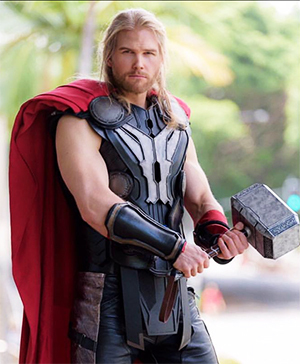 Andrew’s impressive cosplay has seen him work with the Bulk Nutrients team at Comic Con two years running and appear at multiple Marvel movie premieres as the popular Asgardian god. 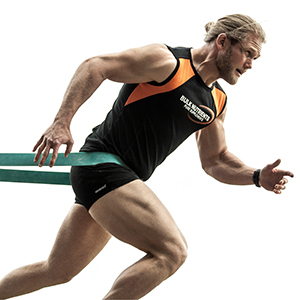 Andrew is also an online health and fitness coach and enjoys sharing his passion for the industry with his clients. 1. How did you get started as an online health and fitness coach? I started years ago, giving health and fitness advice to family and friends as a certified fitness professional. I’ve been employed to provide advice to people within the Australian Public Service and my local community here in Melbourne. Over the last 18 months I’ve had an overwhelming number of enquiries from people within the Cosplay community who are not necessarily looking to become champion athletes, but want to look and feel good in a costume. I now have clients from all over Australia and countries abroad! As I write this, I am training for my first triathlon which I will proudly be competing alongside my fellow Bulk Nutrients Ambassadors in early 2017. This is heavily based around cardiovascular training of course – running, swimming and bike riding, but I will still throw in resistance training one or two days a week. Once I’ve had a go at that challenge i'll return to a fairly simple bodybuilding style routine of resistance training including a “legs, push, pull” split with one or two high intensity cardio sessions per week. 3. How important is nutrition to you and how do you manage it? Nutrition is extremely important to me as any good fitness professional would know it plays a crucial part in your performance, hormone function and general well-being. I regularly review my nutritional intake by keeping notes and maintaining a diary, which has proven to be extremely effective for me. For anyone else, it may not be necessary to do this indefinitely however experiencing the process of note keeping and maintaining a diary will enable people to form great healthy habits which will improve their quality of life. Being a Bulk Nutrients Ambassador has been an absolute honour and privilege. Health and Fitness has been a large part of my life and it’s great to be around that environment even more so now. In my short time this far I’ve had the opportunity to attend some great sporting events and conventions. I have been able to experience a variety of sports I would not have otherwise – such as training for competition in the upcoming ActiveTRI triathlon. I really enjoy meeting people and sharing my passion for sport, fitness and health, through the great supplementation range that Bulk Nutrients provides. Its been a pleasure to be able to help introduce Bulk Nutrients to the wider community. Check out the Thor of Oz for yourself on Instagram, and Facebook. Andrew also has his own website you can hit up too. "For the best mental performance possible. Not only for athletes but actors, models, gamers, students and performers can all benefit from this product"
"A great protein supplement I use daily to increase my intake as an alternative to meat"
"For recovery and to prevent fatigue"